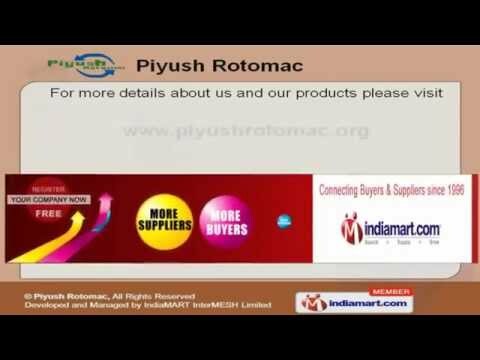 Welcome to Piyush RotomacManufacturer & Exporter of Rotational Moulding Machines & Plastic Processing EquipmentWe are an ISO 9001:2000 certified company, established in the year 2004. Our stringent qualitymeasures have helped us to earn worldwide client base. Timely delivery, competitive prices, customized products & prompt customer support are some of thekey features of ouranization. Our product finds application in Plastic, Pharmaceuticals, Amusement, Construction, Water Tanks & Automobile sectors. Durability, Performance & Dimension are some of our quality test parameters. We are engaged in offering Roto Moulding Machines, Plastic Processing Equipment & RotationalMoulds. Roto Moulding Machines are some of our best selling products. Our Plastic Processing Equipments are widely acclaimed in the market. We offer premium grade Rotational Moulds that are a class apart. For more details, log on at: http://http://www. piyushrotomac.